Choc-full of flavour – tick! Low in fat – tick! Good for the soul – tick! 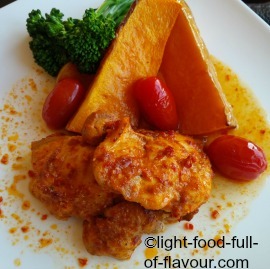 Oh yes, this piri-piri chicken with roasted squash is not only full-on flavour-wise, it is also low in calories. And by serving it with a mixture of vegetables it becomes a healthy meal as well. I add tasty small tomatoes at the end of roasting and steamed or boiled vegetables such as the tenderstem broccoli (broccolini) in the photo. Tomatoes and carrots are better for you when cooked – a rarity among vegetables. Cooked carrots release more beta carotene than raw. Cooked tomatoes have less vitamin C than fresh but the cooking makes the health-boasting lycopene in tomatoes more absorbable. Cook tomatoes in a little olive oil to boost lycopene absorption. Tenderstem broccoli is by far the richest source of a phytochemical called “glucosinolates” – a very important anti-cancer and liver-friendly nutrient found in food. You can of course add many more vegetables to this piri-piri chicken dish than I have done here – like roasted carrots, beetroots and parsnips and green vegetables such as beans and peas. And it is always a good idea to also serve a salad with raw vegetables, topped with a tasty mustard-vinegar-olive oil dressing. A bit of mustard is good for you as it is rich in curcumin – a powerful antioxidant also found in turmeric. 1. Preheat the oven to 200C/Fan 180C/400F/gas mark 6. Place the butternut squash wedges in an oven-proof dish and toss with a bit of olive oil. Place the dish in the oven and roast for 35 minutes. 2. Add all the ingredients for the piri-piri marinade to a small food processor and process until smooth. Place the chicken thighs flat in another oven-proof dish and smother the chicken with the marinade. 3. When the squash wedges have been in the oven for 15 minutes, place the dish with the chicken in the oven as well. Cook the chicken for about 20-22 minutes – until the chicken is cooked through. 4. Add the tomatoes to the squash during the last five minutes. Stem or boil whatever green vegetables you are serving as well. Divide the piri-piri chicken and vegetables between four plates and spoon over the marinade from the chicken dish. Enjoy!